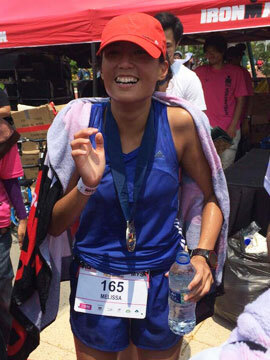 4 Reasons Why You Struggle In The Ironman Marathon | JustRunLah! Many Ironman athletes have a great swim, a great bike ride but a horrible run. Many athletes end up walking the run. They don’t plan to, but they end up doing so. Here are 4 reasons why you may be struggling when you hit the run leg and how to overcome it. Nutrition slash your fuelling strategy is very important in long gruelling endurance races. Eating too much or eating too little on the bike can cost you your run. Eating too much can cause gastrointestinal problems. Blood is drawn away from your stomach to your working muscles. Eating too much will render your body unable to digest the food, hence causing gastrointestinal problems. Too little can cause you to become dehydrated and cause you to hit the wall. Your body just does not have enough energy! Solution: Always practise your fuelling strategy! Remember to never try anything new. No new gels, no new isotonic drinks, no new breakfast. It is hence imperative to always test out your your food intake during your long runs and long rides. This is to better understand how you body will react to such food and fuel. This doesn’t mean you should take it easy on the bike. You just need to manage your swim and bike times such that you have some reserve in the tank for your run. Remember, the ironman is a 3-discipline sport, not a duo-discipline one. Solution: Always make sure you aren’t going all out on the bike. It is easy to let your ego take over. Always remind yourself, saving 20 minutes on the bike could easily mean losing more than an hour on your run. Remember to keep your effort 5-10 per cent below your 70.3 distance effort. If you’re going faster or the same as your 70.3 speed, you know you’re going way too fast. Always always keep yourself in check so you don’t pay the price later on. Often we are tying to save time in transition. We get off the bike, put on our shoes and off we go! The less time wasted on transition equals a better timing no? Unfortunately the answer is no! You should ensure your legs are ready for the run before going out. If not you may end up cramping and wasting more time instead. Solution: Shake your legs out and ensure you are properly hydrated and fuelled before you hit the run leg. Remember to prepare yourself mentally, physically and nutritionally for what is to come. Eat, hydrate and prep yourself mentally! Even sitting for a couple of minutes could do you good. Don’t rush, take your time! Overtraining is a killer. If you’re still doing really long run and long bikes up till one week before the race, your muscles could be still tired from your last hard gruelling session. You will feel the effects especially in the later stages of your race – the run leg – the marathon. And it is here that you will pay the price! Solution: Make sure you taper and rest well before your big race. Always listen to your body and monitor your heart rate. Your tapering should be 2-3 weeks at minimum to allow your body to rest, recover and rejuvenate for your big race! There should be no hard sessions during the final week of your race, but you should keep your body moving with light swims, short bikes and easy runs!